Though unfinished, the Cathedral is open and dedicated. Roger Bede Vaughan OSB is appointed as the second Archbishop of Sydney. The foundation stone of the present Cathedral is laid. 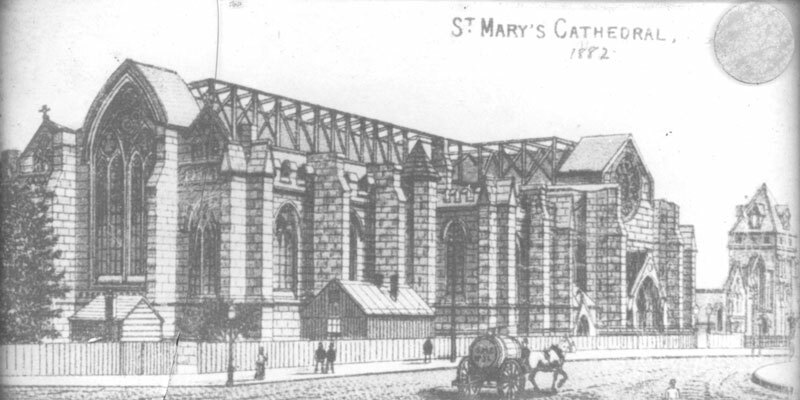 St Mary’s Cathedral is destroyed by fire. Sydney's first Catholic bishop, John Bede Polding OSB, arrives on September 13th, as Vicar Apostolic of New Holland. In 1842 Polding is installed as the first Archbishop of Sydney and thus St Mary’s Chapel is elevated to a Cathedral. The foundation stone of the first St Mary's Chapel is laid by Gov. Macquarie and blessed by Fr Therry. The first officially appointed priests, Fathers Philip Conolly and John Joseph Therry arrive and funds are raised to build a chapel in the colony. A choir is established by Catherine Fitzpatrick, which becomes the St Mary’s Choir. Father James Dixon who arrived in 1800 celebrates the first Mass authorised by the government.